But seriously, the four of us went galfing this past Sunday. We played from the forward tees, as a four-person scramble. We had a blast. Earlier that day I played the same course, our local public course, Orchard Valley in Aurora. 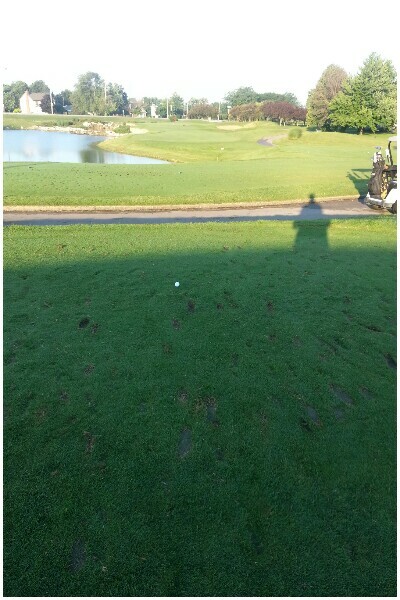 I started on the back 9 around 550AM. This is the signature par-3 12th hole. 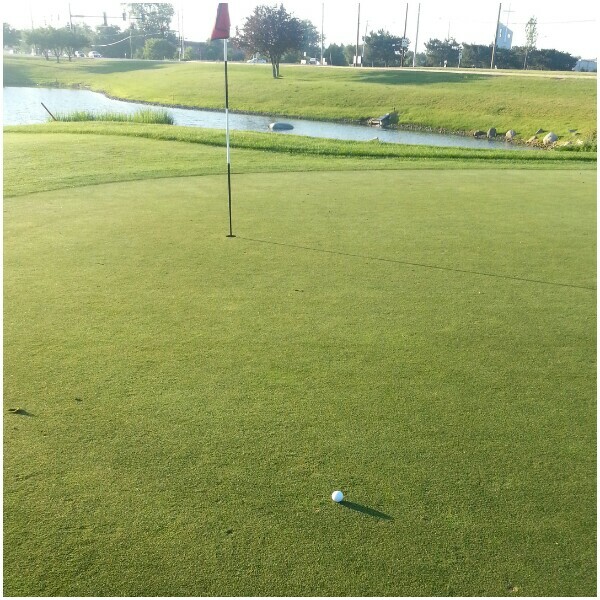 As you can see, I had a birdie putt on this 12th hole. I made par. The approch to #13, a par-4. 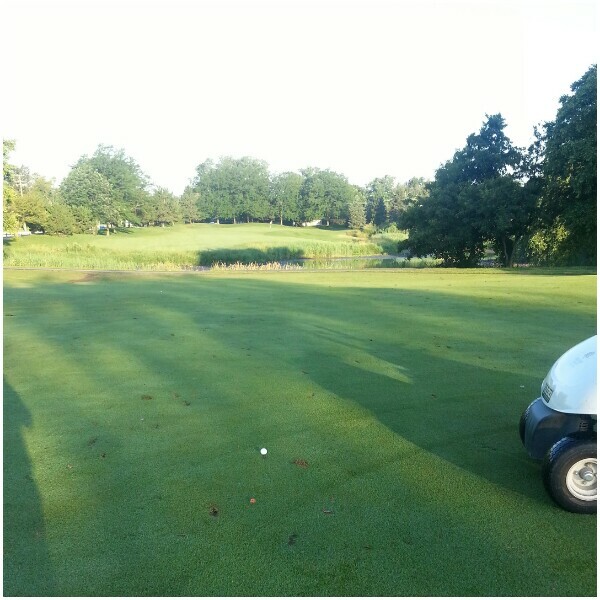 You have to lay up to here, then you have about 220 yards, over water. Alas, I hit into the pond and had to take a drop. This is the look back up #13 from behind the green. Here is the par-5 16th. Hit your drive left, over water, and then it is a 90-degree dogleg right to the green. I left my drive too far right, wound up in the water and had to take a drop. The par-3 17th. I got a par here. 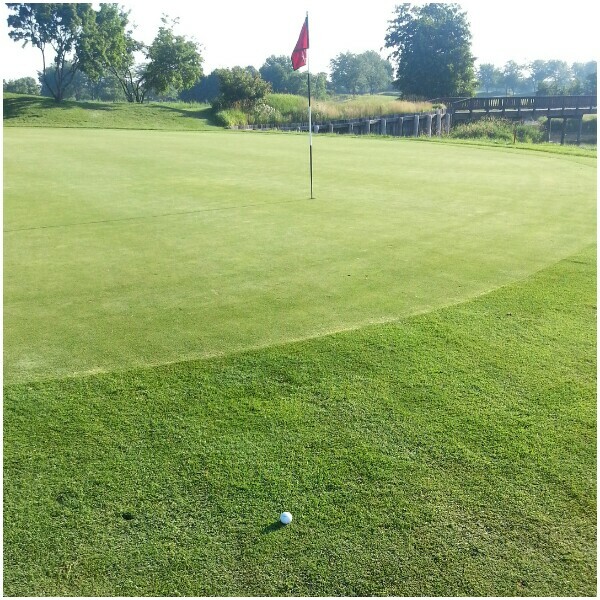 I had a birdie chip, missed, and tapped in for par. I played the front-9 after I finished the back-9. This is the par-4 3rd gole, drive over water. This is the par-4 9th, a monster hole, straight, no water, but LONG. 470 yards. I got a bogey here and considered myself lucky. So that was my Sunday: 18 holes, alone, in the AM. Nine holes with my family in the evening. Lawn mowing and pool-hanging in between. It was a great Sunday.